This is the second in our two-part post on the four phases of strategy deployment. In part one, we focused on what it takes to craft the strategic plan. 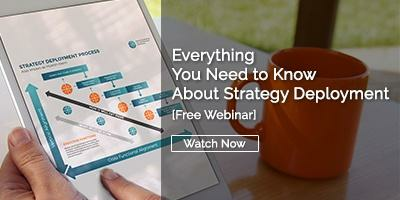 Now we’ll talk about how to bring that plan to fruition by turning to the next three phases of strategy deployment. The strategic plan includes the most important objectives of the company over the next three to five years. It is up to mid-level managers at a departmental level to determine which tactics will be needed to achieve the goals laid out by leadership. Catchball is one continuous improvement technique that is helpful in ensuring that there is perfect alignment between levels of management when it comes to the goals. The approach, in which ideas are sent back and forth between mid-level managers and executives, is an effective way to hone the KPIs and test assumptions. Tactics are never set in stone, of course. They may change as new information is gathered or conditions evolve. For this reason, it is essential to have progress reviews at regular intervals, at least quarterly, if not monthly, during which results are assessed and tactics are adjusted if necessary. Strategy deployment software like KaiNexus makes it possible to track progress toward your KPIs across the organization in real-time, along with measuring the impact and facilitating the Catchball conversations. This is where the rubber meets the road and team leaders and supervisors work through the operational details and process changes necessary to implement the tactics that have been developed. Every employee should have personal goals that are in line with the departmental and organization-wide goals. Many continuous improvement techniques can be useful during this phase including rapid improvement events, Gemba walks, the 5 whys, and PDSA. Catchball also works at this level to keep front line workers and supervisors pulling in the same direction. Improvement management software is enormously helpful when it comes to strategy deployment, particularly during this phase. Each improvement project can be managed, recorded, and easily tracked by all levels of management. It also helps keep this important work top of mind in the face of day-to-day firefighting. 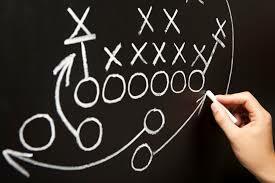 Once the strategic plan is deployed, goals are aligned, tactics are developed, and work begins, it is important for leaders to stay tuned in to what is happening on the ground and to make adjustments to the as needed. Perhaps a new opportunity or threat has arisen that requires an additional goal or a new vision of an existing one. Or maybe the time line needs to be adjusted based on changing conditions. The plan is not something that should be considered final and placed in a filing cabinet. It shouldn’t change at the drop of a hat, but regular review and adjustment is necessary. It could be argued that strategy deployment is the most important thing that executive leadership will do. It is how the organization decides where it wants to go and draws the map to get there. Careful execution of each phase of the process is necessary for success.